Parenting can be exhausting. No surprise there. Have you ever seen your child misbehaving and thought, “I’m going to let that go, just this one time. I don’t have the energy to fight that battle today.”? You’re not alone, mom. I’ve done it — too many times, in fact, as my kids were growing up. Here’s the danger: “One time” rarely ends up being just one time. The more we give in to weariness, temporary apathy or fear of our kids’ anger or disapproval, the easier it is to do it the next time. We may not see the fruit of this immediately. But I’ve been a mom long enough to assure you that it does catch up with you. Today’s eye roll can turn into blatant, verbal disrespect. That “one” missed homework assignment can turn into an overall lack of discipline in school. Like us, children need boundaries and accountability. If we think we can get away with something without consequences, we’re simply more likely to do it. It’s how we’re wired as humans. The thing is: Behavior always has consequences. If we don’t give kids consequences in the safety of home, the world will — and it won’t be so kind. 1. Decide what’s really important and stick to it. We cannot and should not fight every battle. When my daughter was about 10 or 11, she went through a phase where she only wanted to wear basketball shorts and sloppy t-shirts. She hated everything pink or girly. Is this how I wanted her to dress? No, but it was a battle I chose not to fight. Character issues, to me, are the battles that we must win, mom. Preferences, personality quirks — those things may annoy us, but they can’t be what we focus on. If we nitpick on those things, we lose impact and credibility when we discipline them for truly important infractions — like laziness and disrespect. 2. Make every effort to be a united front. Kids love to divide and conquer. They can smell weakness! Believe me, I know, that we’re never going to see eye-to-eye on everything with our husbands or kids’ fathers, but I think we need to do our best to make sure our kids don’t know that. Work out compromises behind closed doors and out of earshot. I know this isn’t always possible, but it’s worth the effort to do everything within our power not to send mixed messages to our kids. 3. Seek accountability. Kids need it. So do we! We’re going to go through seasons where battles are particularly tough. I’ve been there. The middle school years were some of the toughest years of my parenting life. I needed someone to encourage me and to keep me accountable — even more than usual. Someone who knew me well enough to know my weaknesses and the battles I was facing. Kathy provided, and still provides, this for me again and again. It encourages me and motivates me to do what’s right for my kids even when it’s incredibly uncomfortable or difficult. 4. Pray often. When I was going through those middle school years and feeling so weak, every day, I would pray and ask God to give me wisdom and courage. Over and over again. And I can tell you that He did. So many times, I thought I just didn’t have the strength or energy to fight another battle. But as I drew of the power of the Holy Spirit, He gave me just what I needed to do the hard stuff. If this recovering people pleaser can do it, mom, you can, too. I promise. 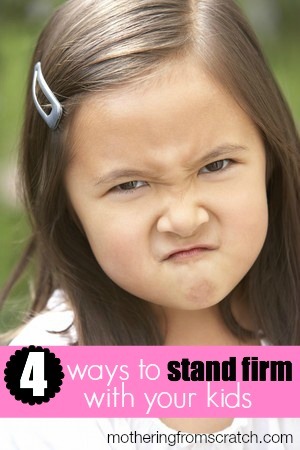 Because when we stand firm, our kids get stronger. LOVED this post! Especially the 4th point! Your blog is so sweet and inspired! Lori Wildenberg recently posted..What is the Bible?